NanoAG – Agricultural research and project based learning at Kodiak Middle and High Schools. Agricultural research and project based learning at Kodiak Middle and High Schools. During the last two weeks, we realized that making planter boxes out of wood for the high tunnel was not feasible. We made the decision instead to use plastic tubs to conduct our experiments in. We bought enough plastic tubs to conduct all of our experiments. We drilled 6 holes into the bottom of each plastic tub for drainage and put the tubs on top of the covers to elevate them off of the pavement. Then, last Saturday, a few of us hauled gravel into each of the tubs to a depth of about 3 inches on the bottom. 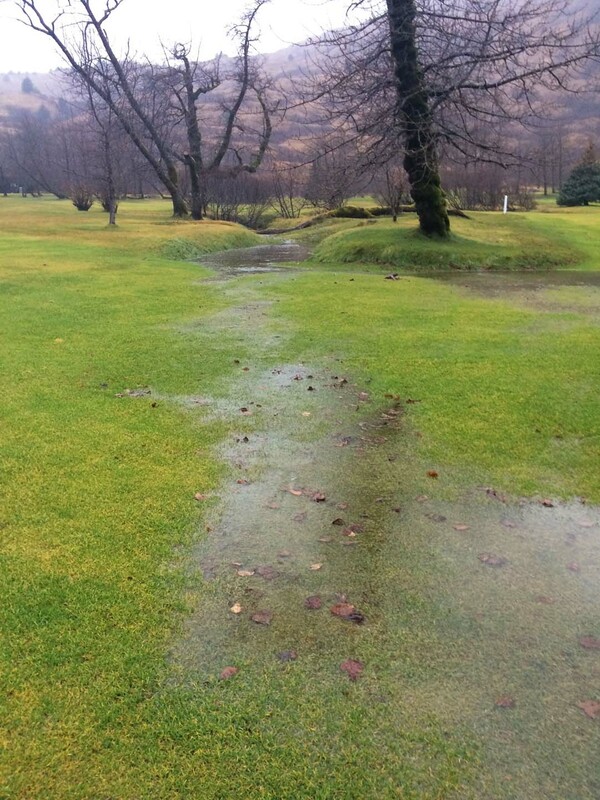 We hope that this will further help the drainage. The next steps are getting the soil into the tubs and installing the fan for ventilation. NanoAg now has a high tunnel that we will be using for experimental research. It is located in the middle school parking lot. On Saturday, May 2nd, our NanoAG group was at the middle school for most of the day. During this time, our group had gone over what types of soil we would use and came up with a supply list for the planter boxes. We put in the frame for the glass doors and put up the plastic. The plastic is a double layer and the layer in between has air pressure inside to insulate it. At the end of the day, the glass doors were installed. We will be having a NanoAg parent meeting on Wednesday, March 4th at 4:30pm in room 210 at Kodiak Middle School. The meeting will be approximately 1/2 hour-1 hour in length. The meeting will be focused on discussions regarding the arrival of the new hoop house. We would like to talk to parents about all things greenhouse related. Please come to the meeting if you are available, even if you can’t make the whole meeting. We hope to see you there. New opportunities to move this project forward at a faster rate have surfaced. We learned that we need to have a fully functional greenhouse up and running by the beginning of March to be ready for the growing season in April. In the interest of time, we ordered a prefab greenhouse that we can get set up and running by March. We will still be doing renovations on the current KHS greenhouse as time allows. Once we get the prefab greenhouse up and running, we will have the resources to conduct soil testing and grass growing experiments. 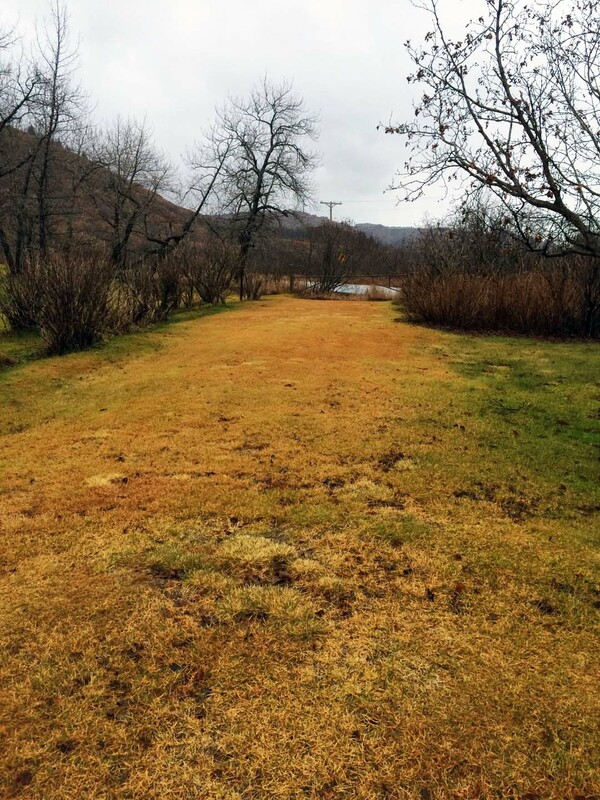 Research on native grasses will be necessary for future testing. KHS (Kodiak High School) greenhouse renovations are under way. We are fixing the flooring and finishing the walls and ceiling. We have started researching greenhouse designs, growing vegetables in a greenhouse, growing grass and golf course maintenance strategies, and optimal growing conditions for peonies. Student meetings for NanoAG have been set for every Tuesday after school, from 3:30-5:00pm in room 210 at Kodiak Middle School. We will be having an informational meeting about the NanoAg Project for parents and students on Thursday, December 4th from 5:30-6:30pm in room 210 at Kodiak Middle School (Mrs. Johnson’s STEAM classroom). Invitation letters will be sent home with interested students on Monday, December 1st. Parents and students should plan to attend the meeting if the students are interested in joining the after school club. Please let us know if you will be able to attend. We hope to see you at the meeting. What is the America Bridge Project? The America Bridge is an incredible opportunity for students and teachers to participate in real world, real time, collaborative projects. Through Trillium Learning, it bridges businesses and industry with school districts to provide students with a chance to conduct real research, develop technology, and gather and interpret real data. This is project based learning at its best! To learn more, please visit Trillium Learning’s website at: http://www.trilliumlearning.com/AmericaBridge/. What is the NanoAg Project? The NanoAg Project is part of the America Bridge in Kodiak. This project is specifically focused on agricultural research and development on soil and water. There are three main aspects that we will be focusing on (the golf course, food crops, and peonies). 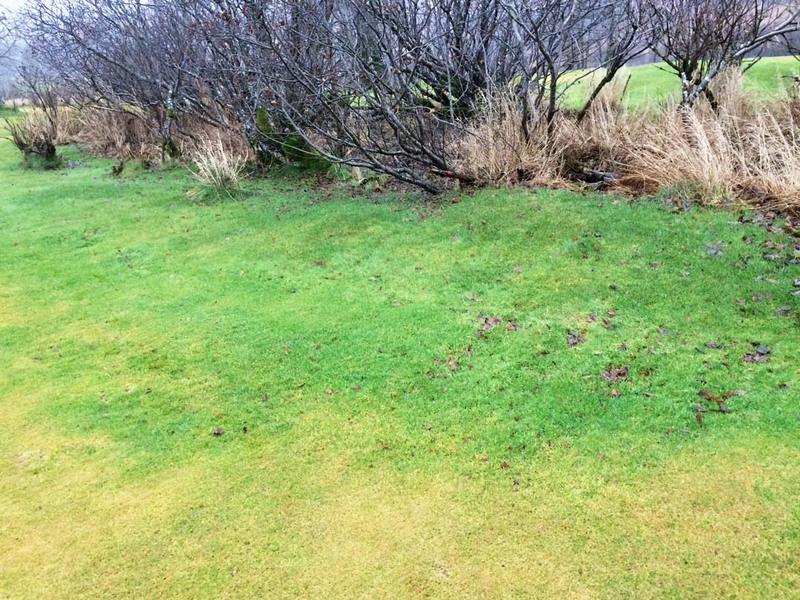 The community golf course in Kodiak (Bear Valley Golf Course) is having trouble growing grass in certain areas (see attached pictures of problem areas). For this project we will analyze the soil and water for potential problems and will experiment with growing different types of grasses under different conditions (both at the golf course and in a greenhouse), with the goal of developing a solution that will result in the ability to regrow the grass and get the golf course up and running again for the community. We will be partnering with the Coast Guard for this project. We will also be growing food crops (carrots, lettuce, etc.) in a greenhouse. We will design scientific experiments to test the effects of an enzyme on food crop production. This naturally occurring enzyme has the ability to take soil that is riddled with pesticides, toxins, and other harmful chemicals, and break down the chemicals into their atomic components. In the process, it will cleanse and restore the balance in the soil. Because this enzyme is naturally occurring, it is also 100% organic. We will be partnering with a company called GMG for this project. We will also be growing peonies in a greenhouse. We will be testing and analyzing soil samples and designing scientific experiments to test different growing conditions for peonies. The goal of this project will be to help our partner, a peony farm in Alaska, successfully grow peonies to sell internationally. Images of the golf course can be seen below. A view across the fairway. 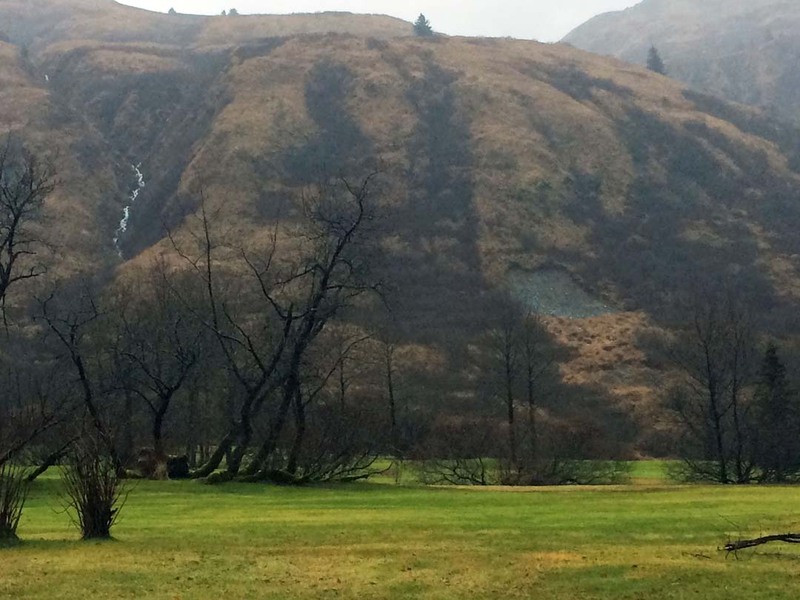 Far view of the landslide up on the hills above the golf course. 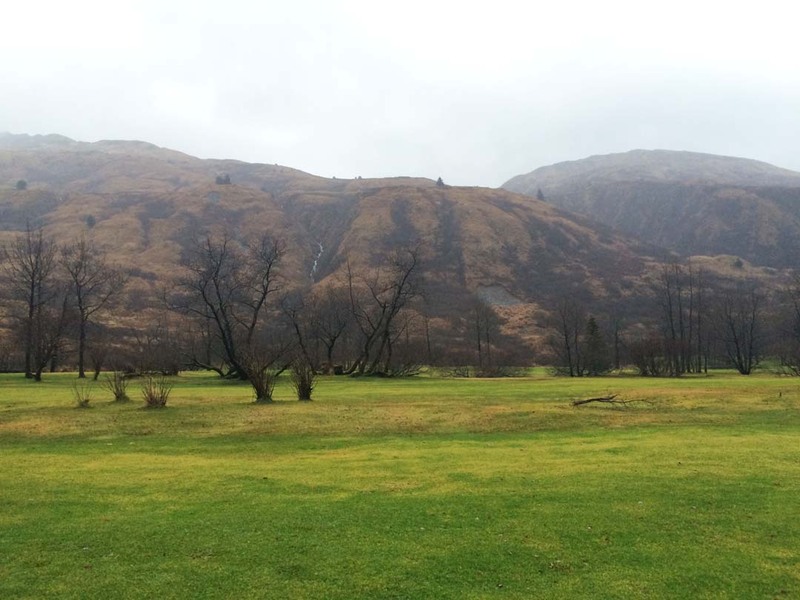 Greener grass in the rough than on the fairway. 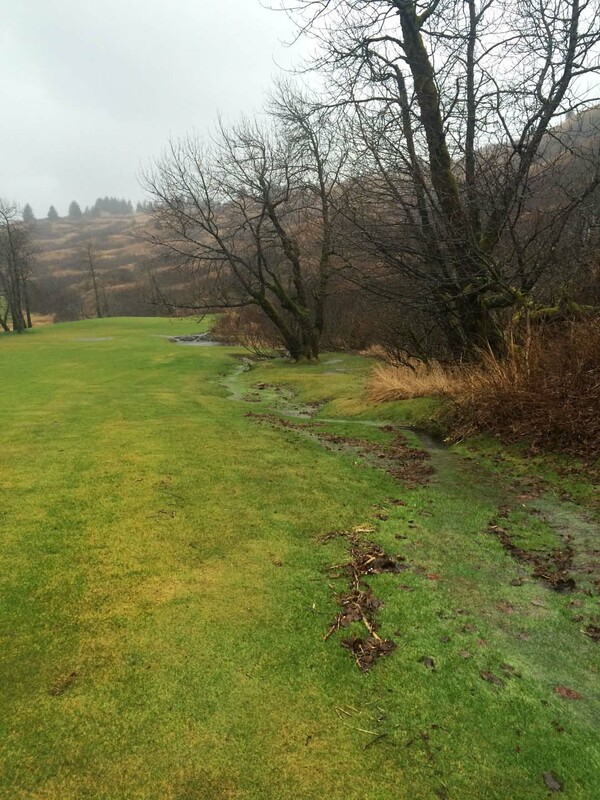 Standing water and stream over the fairway. 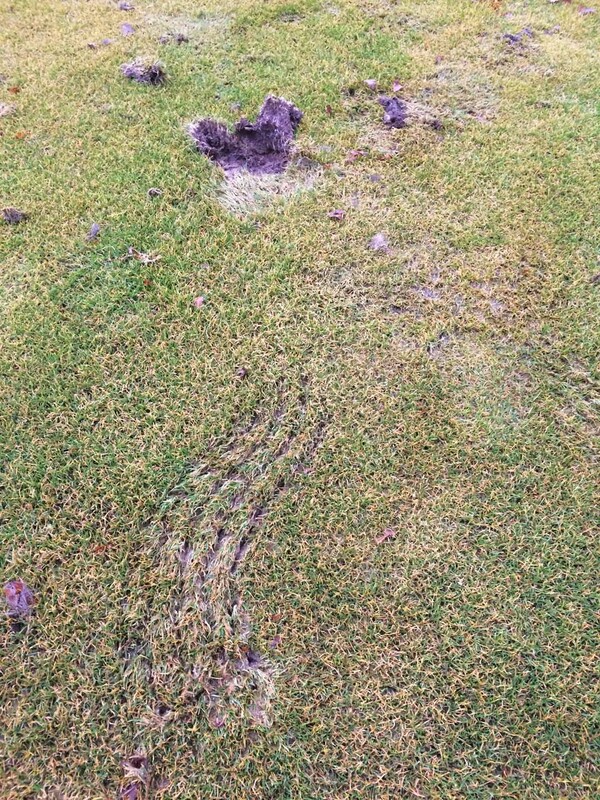 Bear claw marks and a dug up hole on the putting green. Section of the golf course under repair. 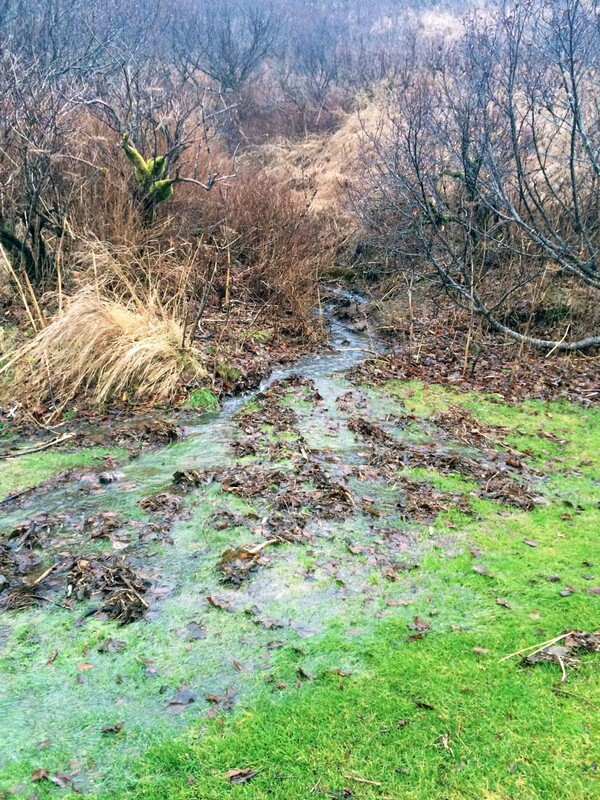 Water run off in the ditch on the side of the fairway. Lots of water runoff from the hills above. 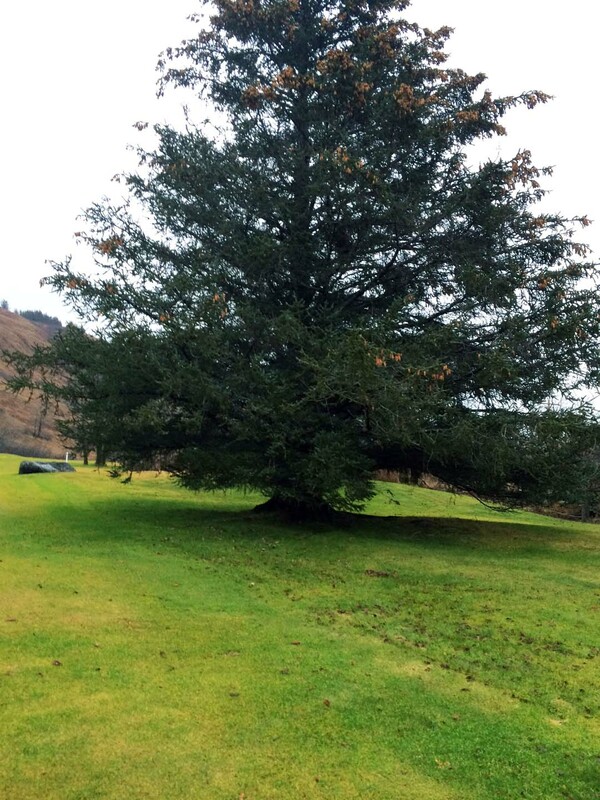 Spruce tree on the fairway surrounded by moss. 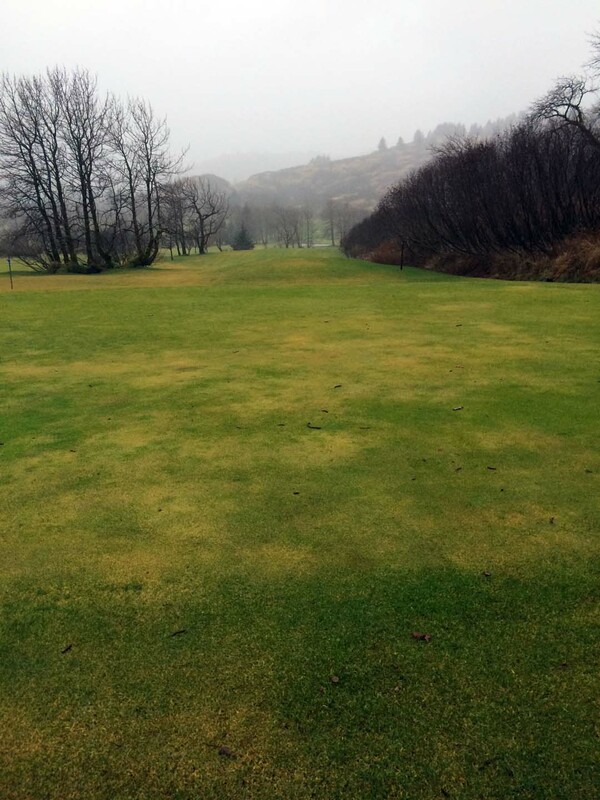 Yellow patches on the fairway.